Did God Make Those Bananas? 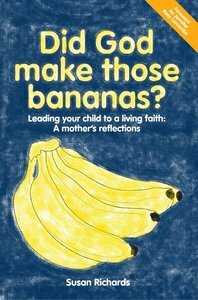 Subtitled Leading Your Child To A Living Faith: A Mother's Reflections, this is a wonderful book for modern young families. Bursting with practical ideas on how to make the Christian faith relevant to children of all ages, this little book will be a God-send to many parents. Jennifer Rees Larcombe in her foreword says, "I wish Susan had written this book 40 years ago when I was bringing up my six children. If you are a parent it is a MUST for you; and if you are a grandparent, godparent, aunt, uncle or friend - buy it and give it as often as you can - I'm going to!" About "Did God Make Those Bananas?" Trained as a nursery nurse Susan originally worked in a junior school in Norwich. She was also the former Regional Secretary of the Torch Trust for the Blind, a Christian mission dedicated to meeting the spiritual needs of blind and partially sighted people. It was here she met my husband Peter and they have been married 26 years and live in Cornwall. They have two grown-up children.A full-time mom, for many years she hosted a weekly Coffee Morning and Bible Study Groups, mainly for young mothers, and was also involved in Parenting Classes. Customer Reviews For "Did God Make Those Bananas?" This book is easy to read and is ideal to dip in and out off. It's a MUST read book if you want to bring your children up in a loving christian relationship. The author, Susan Richards teaches you how to avoid the pitfalls as she has already been there and done it. Thoroughly recommended. Publisher Did God Make Those Bananas?